The existing monuments form an ideal order among themselves, which is modified by the introduction of the new (the really new) work of art among them. The existing order is complete before the new work arrives; for order to persist after the superinvention of the novelty, the whole existing order must be, if ever so slightly, altered; and so the relations, proportions, values of each work of art toward the whole are readjusted; and this is conformity between the old and the new. T.S. Eliot. 'Tradition and the individual talent', Selected Essays, London (1932). Roos Theuws has often used this quote from T.S. Eliot when talking about her work. And when read in relation to her recent work in Bureau Amsterdam, it now seems more relevant than ever. She has presented work from the last three years in such a way that the links between the works generate meanings, which in turn influence the individual pieces. This recent work reveals how new meanings have been added to materials and forms that Theuws has used in the past, placing her entire oeuvre in a new light without detracting from the individuality of earlier work. On entering the space, the viewer is immediately confronted with the piece z.t. (Untitled) from 199798. The work comprises two arms tied in a cross and held in balance by elements hung from them. The length of the arms of this ‘mobile’ are adjusted according to their extreme differences in weight. From the short end of one arm hangs a small monitor, at the opposite, longer end, hangs a bag made from hospital linen. From the second arm, opposite a shapeless lump made of pieces of light-blue Roofmate (roof insulation material), hangs a schematically designed cardboard house. This small house is partially covered in leaves and soaked in wax. On the monitor is a soundless video recording of a woodcutter felling a tree with an axe. In three shots, Theuws filmed the woodcutter cutting a wedge into both sides of the tree and then filmed the tree falling. This video recording links the work immediately to the video installation at the back of the exhibition space where the same videobeams, this time with sound, form part of a double projection. In this installation, with the subtitle Beg, Scream and Shout (1998), two videotapes are projected on top of one another. The upper projection -the same footage of the woodcutter as used in z.t. (1997-98) -covers the whole of the end wall of the space. The projection underneath it is smaller, focusing the viewer’s attention on the formal aspects of the installation. This smaller projection, which also has sound, shows how the woodcutter inflicts another wedge on the felled tree. The fresh, pink wound is filmed in close-up, its form reminiscent of a heart. The rhythmic sound of the chopping axe in both projections resounds through the exhibition space, complementing the silent image on the monitor in z.t. (1997-98). Furthermore, both sound recordings are asynchronous, though at certain points they fall together. With this rhythm and rhythm exchange, the experience of time throughout the exhibition space becomes determined and divided. Thus, the sound registers not only the duration of the events on the video, but also directs the visitor in his looking at Theuws’ work in Bureau Amsterdam. In this way a concept is laid over the exhibition as a whole that takes the experience of the individual works to another level and, in Theuws’ words, ‘raises the specific weight of things’. This also applies to the work Beg, Scream and Shout (1997-98) which Theuws has placed beside the video installation. This piece contains a wax-soaked, cardboard house similar to the one in z.t. (1997-98), which has been placed out of reach on top of a mountain of broken-up pieces of Roofmate. The title of the piece, an increasingly urgent demand, is pinned to the bottom of the mountain. The relation created between the mountain and the video installation makes the pieces less autonomous and thereby less absolute in their meanings. The ‘specific weight of things’ is also weighed by Theuws in her hanging constructions. One piece which is hung in the central space of Bureau Amsterdam is called Unequal Things Measured by Each Other (1997). Here too a number of elements from Theuws’ earlier work have been brought together. On one of the three arms there is yet another schematic house, this time made from Roofmate and somewhat larger than the others. A bundle of glowing fluorescent tubes sticks out of it; the electric cables run across the floor to the wall socket. The cold fluorescent light deprives the house of any suggestion of shelter. On the second arm, a sack of hospital linen hangs right down to the floor, large enough to hold a person, like a body bag. On the third arm, blocks of Roofmate are held up, or let down, by steel wire. The blocks appear to be the beginnings of a construction with a floor, wall and ceiling, yet in their fragmentation they represent deconstruction. By bringing these unequal elements in balance with each other, Theuws indicates that there is no absolute measure of things, neither within nor without her work, neither in the imagination nor in the judgement of it. Eliot’s words, which point to a relative value judgement, become relevant once again. Thinking about the relative values of things brings Theuws to the mental weight of the elements she repeatedly uses in her work. In this way, the meanings of hospital-linen bags increasingly broaden, and at the same time acquire meaning as marks of style. The same is also true for the other materials and forms which reappear in Theuws’ work and which gain weight within the broader context as her oeuvre grows. The process of attributing meaning hereby shows itself to be affected by time and constantly changing. 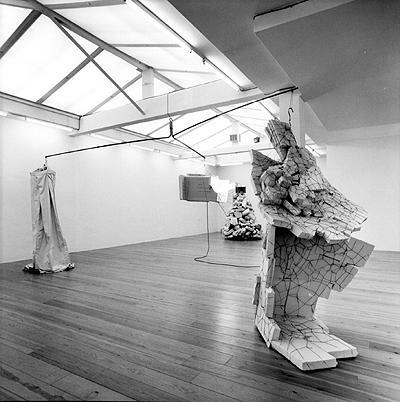 The connotations of the linen bags within this exhibition are balanced with the meaningless character of the roof insulation. For Theuws Roofmate is ‘neutral, directionless stuff without grain or structure’ which enables it to avoid or undermine interpretation. Where blocks of the material indicate the fragmentation and deconstruction of form in one work, in others Theuws creates form out of Roofmate, as in z.t. (1997). In this work, which is positioned in the central space, two enormous wings of the insulation material rise up above a bundle of PVC pipes which, through their form and colour -they have been painted in aluminium paint- refer to fluorescent tubes. The upward motion of the wings starkly contrasts with the position of the sculpture lying flat on the floor. Between the wings Theuws has swung an axe which links this piece to the video recordings of the woodcutter. The axe appears to have slain the sculpture and hence the desire expressed by the wings. With the creation and simultaneous destruction of the form, Theuws also presents an attitude in which the making of the work is turned into a point of discussion. The recent pieces in the exhibition indicate how Theuws more and more openly identifies with the human condition in her work. This is true both of the work in which the hospital-linen bags refer to human measurements or human condition and of the video recordings in which the wound cut in the trunk of a tree evokes associations with the body. The two oldest pieces in the exhibition, Arm and Catch On the Rebound, both from 1996, formally refer to the human body. Arm comprises, among other things, a schematic form of an arm and fingers built up out of Roofmate. Above this arm hangs a wire network resembling arteries or a drawing for a tattoo which, together with the nails stuck into the Roofmate, also suggest cuts and grazes. In Catch on the Rebound, a sculpture hanging from the ceiling, we can recognize the profile of a hand which seems to hold onto the hospital-linen bag below it. The hand is transected by forms that refer to human vertebrae. The use of a real object such as the axe in z.t. (1997) and the films of real time and space in Theuws’ recent videos also indicate that a more explicit appeal to the physical experience of the viewer is now being allowed. In earlier video pieces, this took place through far more abstract images. In earlier installations, Theuws abstracted recordings of reality by digitalizing them in the computer or used video images that were generated from the medium itself. In the series Forma Lucis she showed the physical mixing of different coloured lights that came from electronic impulses. Through their formal structure, these installations appear more cerebral and minimal than the recent work shown in Bureau Amsterdam. And yet, as far as Theuws is concerned, the Forma Lucis series appeals to the viewer at the same, sensuous level. The light evokes an experience as if someone were first gently and then roughly stroking your skin. Equally, the recent videos are more than just registrations of real time and real space. The recordings are again used to achieve a structure in the work that brings the viewer to the level of sensuous experience. The origins of the emotion therefore lie not with the artist nor in the empathy felt by the viewer, but in the idea that Theuws lays over the exhibition as a whole. That idea is more important to Theuws than what takes place at the level of experience. The structure within and between the works is indicative of this. By visually and aurally linking the works in the exhibition, she is opening up a network of interpretations for the viewer which is growing increasingly more dense. Each image is thus the starting point for the process of forming and applying meaning.